Bhai Sahib’s headlock, the chubby inspect Hari Prasad died. Then the next officer shot Bhai Sahib 30 times but Bhai Sahib was still standing and challenging the Indian security forces. Bhai Sahib attained shaheedi after the thousands of cowardly officers shot Bhai Sahib the lone lion again. 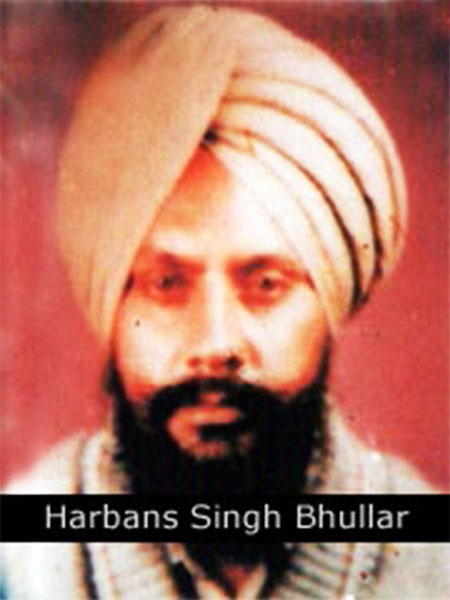 Bhai Harbans Singh Bhullar Babbar was born in the financially struggling household of Sardar Kartar Singh and from the womb of Mata Gurdev Kaur on the month of Visakhi in 1962. After taking the Hukamnama from Sri Guru Granth Sahib Ji the family named the child, Bhai Harbans Singh. The whole family of Bhai Sahib were followers of the Sikh principles. Bhai Sahib’s mother’s family was from village Ramayana and as Mata Gurdev Kaur had no brothers, Bhai Sahib stayed in Ramayana with his grandparents from childhood. Bhai Sahib studied a local government school of Ramayana up until 8th class and later studied up till 10th class as local school of village Bhullar, where Bhai Sahib’s family originally was from. In 1979, Bhai Sahib got a job as an electrician at the Guru Nanak Thermal Plant, here Bhai Sahib worked for 2 years. In 1980, Bhai Sahib married Bibi Jaswinder Kaur daughter of Sardar Inder Singh from Bahebal Kalan. Then in 1984, Bhai Sahib saw the birth of his first daughter and in 1986 the first son. After leaving the job at the thermal plant, Bhai Sahib started working at his farms in Bhullar. Bhai Sahib had met Bhai Harbhajan Singh Deliyanwali, a singh of Babbar Khalsa at local gurudwara of Ramayana. Bhai Sahib soon started attended the Akhand Kirtani Jatha Rehnsbhai smagams and meeting singhs of the Sikh Freedom Movement. Bhai Sahib wanted to take amrit and attempted many times to do so, but Bhai Sahib was always sent home as the Rehat Maryada states that married couple should both take amrit and not alone. The Panj Pyare asked Bhai Sahib to take amrit with his singhni. Soon Bhai Sahib left home and family to become a part of the Babbar Khalsa International and start punishing the enemies of the panth. Bhai Sahib would plan in to the future as well as present with his sharp thinking skills. While in doing sewa within Babbar Khalsa, the Panj Pyare decided to give Bhai Sahib Amrit as he had left home to become a freedom fighter. Bhai Sahib had started going to villages of Punjab and secretly recruited singhs into the Sikh Freedom Movement. In 1989 Bhai Sahib was arrested at a Jor Mela due to an informant feeding the police with information of Bhai Sahib’s location. Bhai Sahib was charged with many small cases and after 22 days in police custody Bhai Sahib was granted bail. After being released Bhai Sahib was given a secret name of Bhai Karam Singh Handy by the singhs of Babbar Khalsa. Bhai Sahib would gather information of black cats and informants from villages to punish them later. Bhai Sahib wanted to punish the politicians and the police officers that had proved the killing of innocent Sikhs. The Babbar Khalsa placed Bhai Sahib with Bhai Hari Singh Lehra Babbar and Bhai Meharban Singh Bhuttar Babbar. Together these singhs reached new heights of success within the Sikh Freedom Movement. Bhai Sahib had been staying at relative’s house in the village of Bhokre, district Bathinda to attend a Visakhi program. From here Bhai Sahib was to go Dam Dama Sahib, in Sabho Ki Talwandi along with Bhai Balwinder Singh Ganga Babbar but the family whose house Bhai Sahib was staying at did not have a good relation with the locals of the village. The information of Bhai Sahib staying in Bhokre was given to the police by a local villager. Sunday 5th April 1992, 2 o’clock in the morning the Punjab police, CRP and BSF had surrounded the village of Bhokre. Bhai Sahib had done his amritvela nitnem and was on his way to the local gurudwara to do darshan of Sri Guru Granth Sahib Ji. The Indian security forces tried to arrest Bhai Sahib alive as they thought they could get important information out of him through torture. As Bhai Sahib walked towards the gurudwara, an officer named, Hari Prasad tried to pounce on Bhai Sahib but horribly failed, Bhai Sahib grabbed this chubby officer and put him in a tight headlock. The rest of the Indian security forces was shocked to see this and didn’t know what to do. Bhai Sahib tried to reach of Hari Prasad’s Sten gun but as the chubby officer was squealing and twisting, Bhai Sahib did not succeed. Within couple of minutes in Bhai Sahib’s headlock, the chubby inspect Hari Prasad died. Then the next officer shot Bhai Sahib 30 times but Bhai Sahib was still standing and challenging the Indian security forces. Bhai Sahib attained shaheedi after the thousands of cowardly officers shot Bhai Sahib the lone lion again. Before the sunrise the police took the body of Bhai Sahib and the chubby inspector to Bathinda for post mortem. The whole Sikh nation salutes Bhai Sahib.